With more than 50 percent of the public in favor of decriminalization, it's high time for America's stoners to come out of the shadows. Get loud, be proud, maybe get off the couch today and show everybody your stoner pride with the High Kite. The High Kite from The World's Best Ever, is exactly what it sounds like—a kite. You all know how kites work, right? But when combined with its Journey carrying case/3-footer and a bit of sticky-icky, well, you've got yourself a marvelous afternoon chilling in the park. Hand-stitched out of ripstop nylon by Miami-based master kite-maker Dan Ward, the 34" HIGH Kite is a statement in the sky. 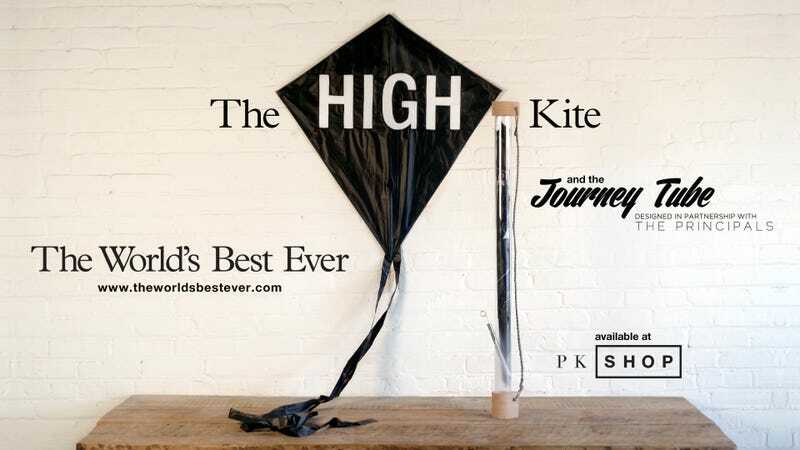 Literally embracing the century-old phrase "high as a kite" while referencing the kite as a means of advertising in the same era, the HIGH kite celebrates the lifted. With a stylistic nod to the legendary acrylic Tobacco Master Water Pipe, the Journey Tube is a 39-inch, fully functional travel case designed in partnership with Brooklyn-based industrial design studio The Principals. The set will be available from the gallery's online and in-person shops beginning June 5th.